The University of Wisconsin men’s hockey team (6-7-3, 2-3-3-1 Big Ten) hosted No. 6 Penn State (10-4-1, 2-3-1-1 Big Ten) and their high-powered offense for a two-game series this past weekend. Hosting a team that entered the weekend with the nation’s highest-scoring offense and sported the nation’s two leading goal scorers, the question was not whether Wisconsin would suddenly be able to quell the Nittany Lions’ offensive attack, but whether Wisconsin could find an offense of its own. Coming into Friday’s affair, the Badgers had scored a total of four goals in their previous four games, a road stretch that featured two losses in Columbus to The Ohio State and two ties in Ann Arbor to Michigan. Six minutes into the first period, however, their offensive slump seemed a thing of the past as Brock Caufield tipped a Tyler Inamoto slapshot into the back of the net for the third goal of his freshman campaign. The first twenty minutes, however, saw the Badgers fail to capitalize off of Penn State’s turnovers. The Nittany Lions aggressively attacked the net, but the Badger defense was able to hold its own and exit the period relatively unscathed with the score tied 1–1. The second period found both teams on a seesaw — one team scoring to take the lead and the other quickly answering. Thanks to a Max Zimmer goal off a beautiful pass from Seamus Malone, and Brock Caufield finding the back of the net for his second goal of the night, the Badgers were able to keep pace with the Nittany Lions and send the game to overtime tied at three after a scoreless third frame. Two overtimes and 12 penalty shots later, Penn State won the shootout and came away with the extra point in the Big Ten standings, though the game ended in a tie. Penn State outshot Wisconsin and held a significant edge in faceoffs won, though the Badgers blocked more shots than their opponent. Daniel Lebedeff had 37 saves in the effort. While a tie was not exactly what coach Tony Granato had hoped for, he was pleased with his team’s effort. 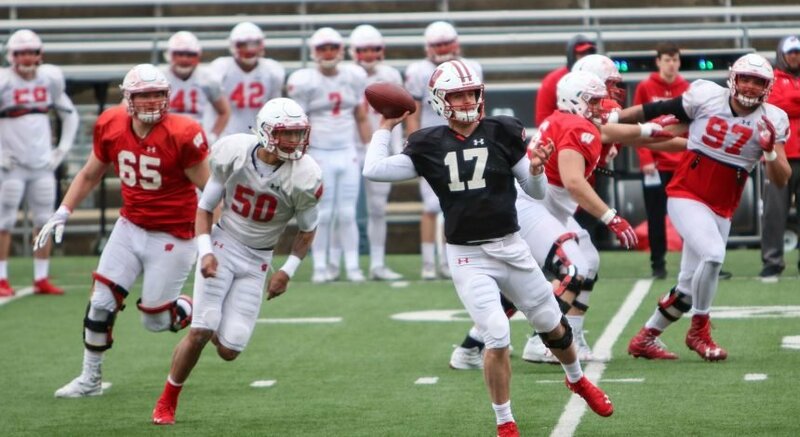 The second game of the series featured more offensive firepower than Friday’s matchup as the Badgers came away with a much-needed 8–5 victory. 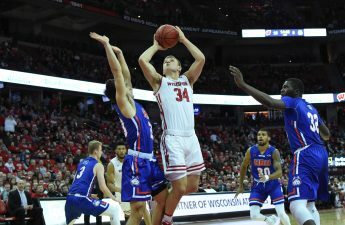 Entering Saturday 1-5-3 in their last nine contests, the young Badger team hoped for a statement win, and an impressive third-period scoring outburst helped them achieve their goal. 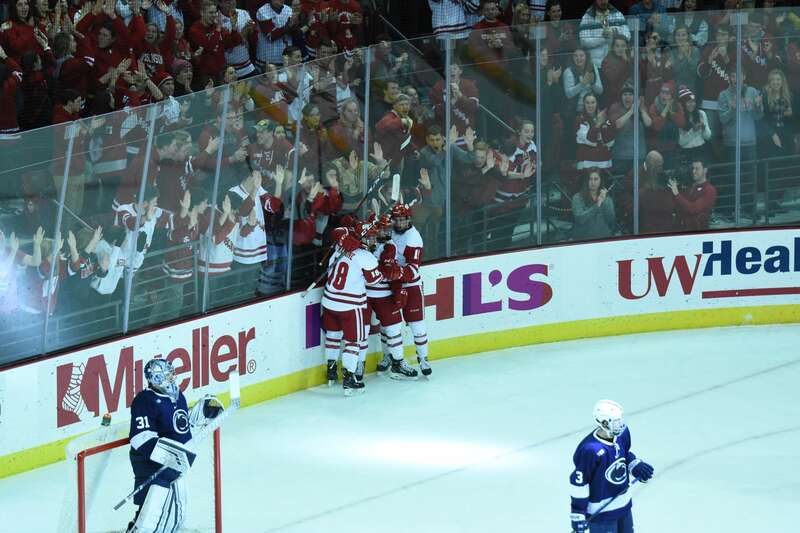 In a tale of scoring runs, Wisconsin began the game hot and led 3–1 early in the second period. Penn State then scored four unanswered goals, thanks in large part to the play of sophomore Evan Barratt, who netted his 12th goal of the season, the most in the nation. With five minutes remaining in the second period, the Badgers found themselves down 5–3 and in need of a spark. 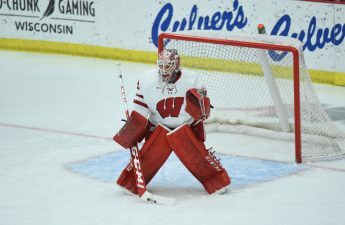 Luckily for Granato and his team, the spark came at the right time, with Wisconsin scoring five unanswered goals to close the game and win 8–5. When speaking to UW Athletics after the game, coach Granato praised his team’s ability to respond to Penn State’s offense success. “You look up at the clock and you are trailing by two. The response after that was outstanding … sooner or later, if you keep staying with it, you will eventually get something,” Granato said. The Badgers will look to carry the momentum from an impressive weekend into next weekend’s two-game series at home against Michigan State.